The Michigan Tech Rowing Club and all of the participants at the Iron Oars Regatta in Marquette with their trophy. 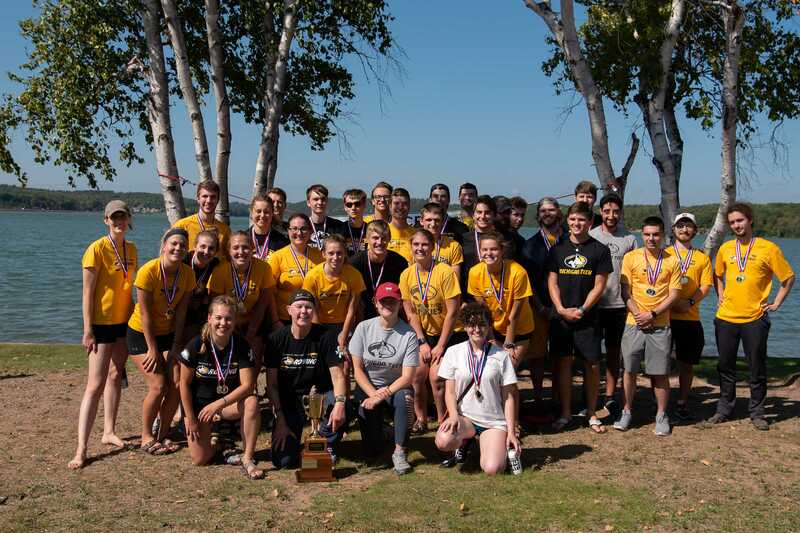 To start their season off, the Michigan Tech Rowing Club won the Iron Oars Regatta in Marquette during the weekend of the 15th. It was hosted by UPCRC and featured Michigan Tech and Northern Michigan University. Each team rowed across Teal Lake in Negaunee for the College Division. Each Michigan Tech boat won their race during the Iron Oars Regatta. The Men’s varsity eight set a course record of 10 minutes and 30 seconds. The Michigan Tech Rowing Club will travel to De Pere the first weekend of October for the Tail of the Fox Regatta. Soon after they will be heading to Twin Cities in Minnesota for the North Star regatta. The Rowing Club has all of their own equipment and brings their boats to the regattas. They have 3 eights, 2 fours, a single and a double scull, and their quad. The double and single are coach Terry Smythe’s personal boats, which she lets the Rowing Club use. Coach Terry Smythe accompanies the team on all of their regattas and is extremely dedicated to the team. “She is highly committed to the sport and helps us any way possible,” said Koerber. The Rowing Club diligently practices for their regattas. Every day at 5 a.m. the team goes out and rows in the Portage until 7 a.m. In the evening, they do dry land practices as well. “It’s a lot of work and it takes a lot of commitment. A huge part of rowing is the commitment to get up at 5 a.m. and being punctual and on time. If you’re late then your boat is late.You have other people relying on you, because if you’re late then everyone else in your boat can’t go out on the water,” explained Ashlyn Steer, a novice rower on the team.